You hear stories about people waking up at their own funerals and usually you can dismiss them as being fake or exaggerated. Well this story is not only shocking, but was caught on tape and uploaded to YouTube. 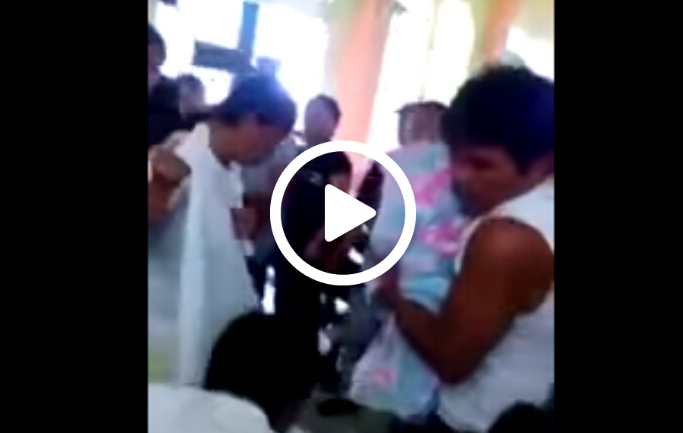 On Sunday, a 3-year-old girl who was previously pronounced medically dead woke up at her funeral in Aurora, Zamboanga del Sur, which is located in the Philippines. The Aurora Police Department’s Senior Inspector Heidil Teelan confirmed the occurrence to the Phlippine Star. The girls name has not yet been released, but she had apparently suffered through several days of a high fever before she was pronounced dead at a local medical clinic. The funeral was arranged for the young girl and during the service a attendee removed the “cover of the coffin to arrange the supposed remains.” He then “saw the head of the girl move” according to the paper. This event was caught on video and can be seen below. The shocking event is either a miracle or an unexplained medical phenomenon.